For information on our product range, please click on the links right. 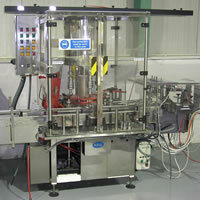 The Newman CTE 250 is a fully automatic labelling system which applies a self- adhesive tamper evident labels (security labels) to erected cartons. 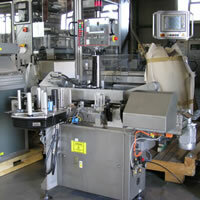 The machine's compact design permits easy integration into existing packing lines. Year of manufacture 1994. Stk # 1301: HARLANDS LABELLER, MODEL "SIRIUS"
Front and back double sided self adhesive wrap round labeller. Year of manufacture 1993. Arranged for hand feeding, complete with a choice of change parts for tablets and capsules. 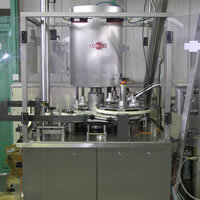 Collator / sleever / shrink wrapper for bottles. 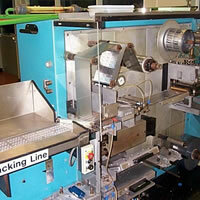 Operation: Stretchwrapping with subsequent shrinking of single or multi-packs with PE-film. Products: Cartons, cans, bottles, aerosol cans, blisters, and so on. Design: Compact and solid modular design, integrated pneumatic and electrical cabinet. Aluminium table surface, dynamically stressed parts are weight-optimized. Hardened shafts with ball bearings. All surfaces are made of corrosion-resistant material. 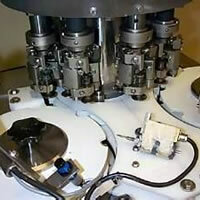 The machine fully meets the GMP requirements. Large-sized guard doors. 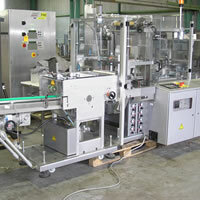 The machine is designed and built according to the CE-specifications. 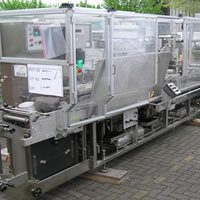 Two metres infeed slat conveyer with Gronmeyer device for channelling bottles from one lane into two lanes thus doubling the speed. 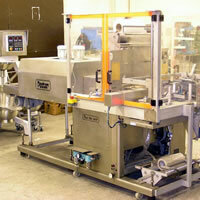 - 40/min single lane; 80/min twin lane conveyer. Change parts for size 100ml & 140 ml bottles. 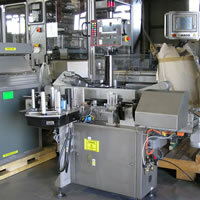 90 degree pusher collates the bottles into rows. 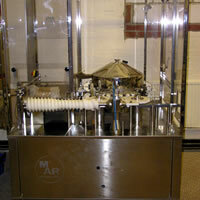 Groups currently handled by this machine 12 ( 4 x 3 ) and 20 ( 4 x 5 ) Machine manual available. Fully safety guarded. 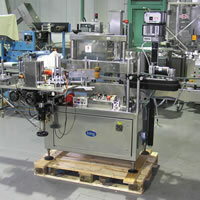 Complete with ATLC automatic, pneumatic container feed system. Variable speed up to 40 containers per minute (depending upon product and container). 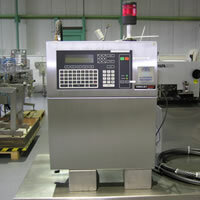 Fitted with mains on/off, variable speed controls for tablet feed, electronic counter indicator. 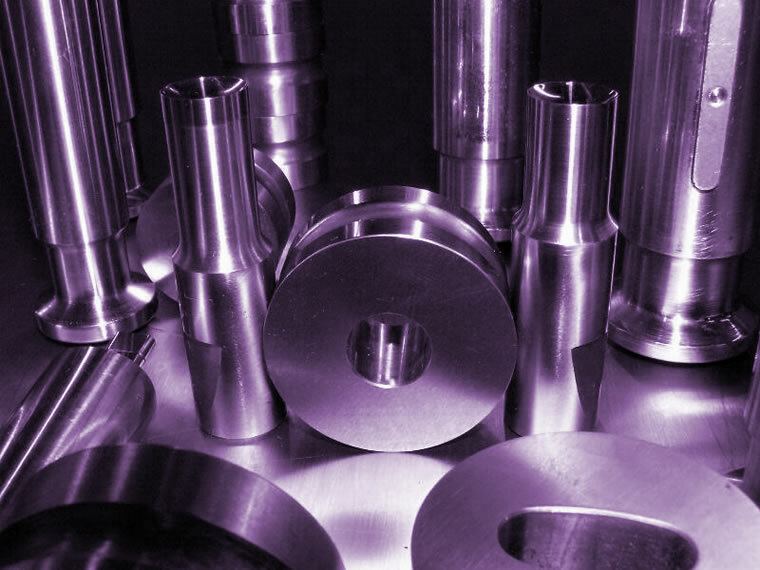 A full assortment of change parts available ranging from 30-70mm diameter with a 1.5m variable speed conveyor & 1m conveyor fitted with a 360mm rotary table. Fully stainless steel construction with fully interlocked guarding, built to GMP standards, Mechanical cap feeders, Air operated, positive cap pick-up chucks to apply side grip pressure no cap/no bottle detection. Output: 120 packs per minute. Bottle Diameter ranging from: 18 -105mm. Bottle Height: 50 - 305mm. Cap Diameter: 10 - 50mm. Cap Height: 9 - 30mm. 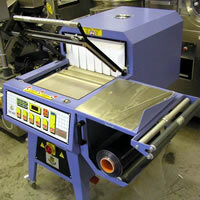 Production: up to 540 blisters per minute depending on format size. Mechanical speed per minute i.e. Strokes per minute: up to 55. The stroke length ranges from: Minimum 115mm to Maximum 155mm. Size Range: Minimum 90mm to Maximum 255mm. Blister Length 60mm. Blister Width ranges from 30mm to 85mm. Forming Depth ranges from 3mm to 12mm. Number of Blisters per cycle ranges from 1 to 12 Blisters. 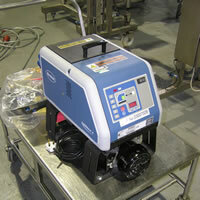 Used in conjunction with Nordson hot melt hoses and guns to create a hot melt application system. 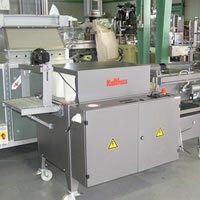 The melter liquifies solid-form hot melt and maintains the hot melt at the desired temperature. When the guns are activated, the melter pumps the liquified hot melt through the hoses and out the gun nozzles, where it is commonly applied to the surface of a product. A front and back double sided self adhesive wrap round labeller, fitted with a variable speed plastic slat conveyor, patch labeller with wrap round unit and scroll feed and bottle guides & product detection & missing product sensors, Overhead stabiliser unit removable reject bin, Air supply filter / regulator 80psi capacity approx 60 units per min. The base unit consists of fabricated steel frame clad with stainless steel support plates. Electrical supply: 240v / Phase 1 / 50Hz via mains supply. Year of manufacture 1993. Applies pressure sensitive labels to all shapes of containers including plastic, glass & aluminium etc.The basic machine will label round containers, single panel labels on square or rectangular containers and spot labels on oval shaped examples. Containers of up to 153mm diameter by 254mm high can be handled in the standard set-up giving a wide range available for labelling. Fitted with a scroll infeed & vibratorybowl cap feeder. 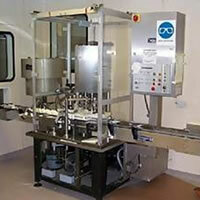 The Qualiseal is designed to seal the joined portion of the cap and body of filled hard gelatine capsules. 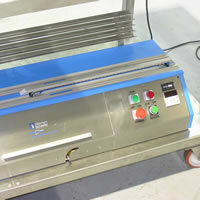 The HS 100 - EXCEL bagging unit feeds empty polythene bags mounted on a roll into the bagging area. 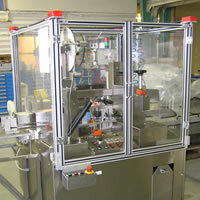 The unit is intended to feed, open, seal, and separate poly bags. At the bagging area the bag is opened by a pulsed jet of compressed air, filled with product(s) and sealed. In automatic mode the bags are filled and sealed automatically. 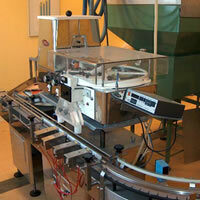 In manual mode the bags are filled manually and the sealing function is activated by means of a foot switch. Bag sealing occurs when the pressure bar compresses the top of the bag against a teflon covered heating element. The unit can be ser to use either 110 or 240 Volt electrical power supplies. 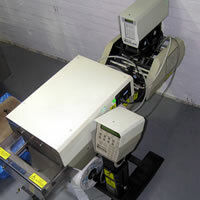 A continuous stream, non-contact ink jet printer. The Series 1701 UHS can code virtually any surface, texture, contour or shape. Printing is controlled through the built in keyboard allowing a wide variety of print features including: one, two, or three lines, Upper and lowercase letters, store messages, multistroking (offering varying bold single-stroked lines), reverse print, inverted print, current time and date / auto expiration date, print a bar code, insert a graphic character or design, print a serializer (successive numbering), print a code in the same location on each product, regardless of product etc. Electrics: 100-240V - 2-1amps - 50/60Hz - single phase. Air Requirement: 100 psi / 6.9 bar.